We've reached the projected halfway point of our renovation project and Sisters are beginning to show signs of "renovation fatigue!" Remember as a kid during long car trips you would ask your parents, "Mom, are we there yet?" Well, we're sort of beginning to feel the same way! It is gratifying to see the weekly progress being made and also seeing how much work there is to do! Lots of little things but things that are important. 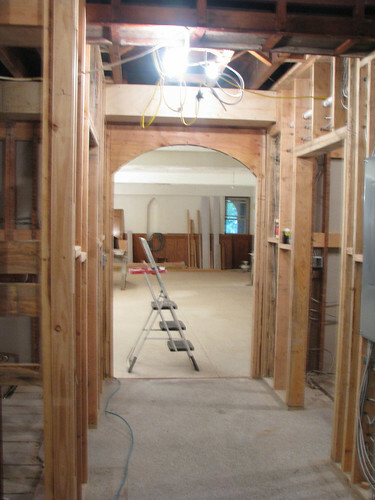 Like pipes and cats, molding and arches, wires and a door opener that pops out when needed in the new kitchen door! New pictures are up on our website: www.futurefullofhope.com. We also figured out (finally!) that we can link directly to flickr giving you a full screen with captions! It's good thing this project is taking 6 months! We are grateful for your donations for this project. It was even more needed than we fully realized. If you know of anyone who can help us with the last $15,000 to come to our goal of $500,000 please let them know of our need. May Our Lord, Our Lady and St. Joseph reward you with every good thing both spiritual and material! The Contemplative Life Now Available on Kindle!